(Broward County, Florida, November 12, 2018). 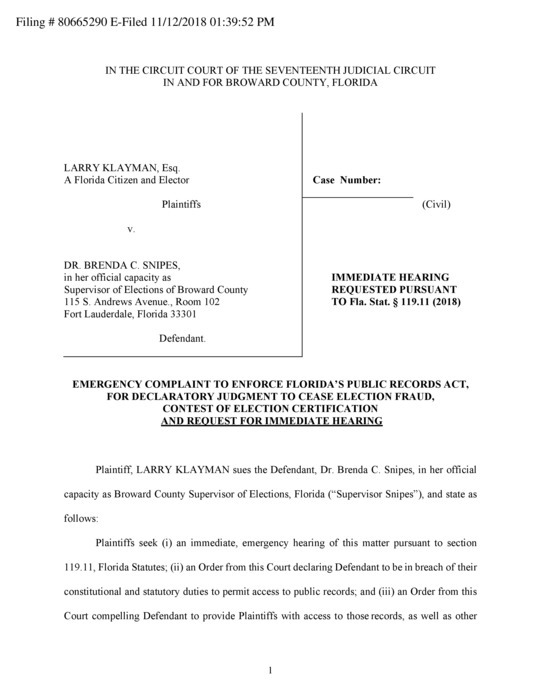 Today, Larry Klayman, a Florida citizen and elector filed a complaint against the Supervisor of Elections of Broward County alleging fraud, misconduct and corruption, as well as denial of access to the inspection of ballots under the Florida Public Records Act, with regard to this latest election scandal in the Sunshine State. The case is styled Klayman v. Snipes, Filing No. 80665290 and was filed in the Circuit Court of the Seventeenth Judicial Circuit for Broward County, Florida. A similar companion complaint will be filed expeditiously in Palm Beach County, where allegedly there is also fraud, misconduct, corruption and denial to ballot access occurring. Klayman, the founder of both Judicial Watch and Freedom Watch, a former federal prosecutor and U.S. Senate candidate in the Republican primary in 2004, previously participated in his personal and public interest capacity in the famous Gore v. Bush litigation in 2000, appearing before the Honorable N. Sanders Sauls in the litigation which ensued in Leon County. "I am filing this action and a companion one in Palm Beach Country to preserve and protect the much maligned integrity of the Florida electoral system. 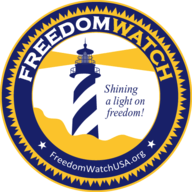 A copy of the complaint can be found at www.larryklayman.com and www.freedomwatchusa.org and is embedded below. It is important for a non-partisan, such as myself, to play a role in this regrettable new voter scandal, and not leave it to the lawyers for the Republican and Democrat parties to manipulate the outcomes of the state gubernatorial and U.S. Senate elections. "As a proud citizen of Florida, I want to see that the person who really won the election actually did win! 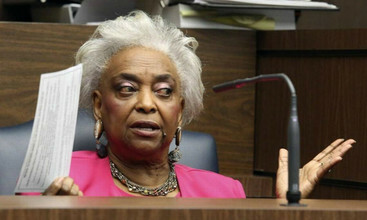 Regrettably, given the history of Broward County Supervisor of Elections Brenda Snipes, there is more than a possibility that unless legal action is quickly taken, that the votes of Florida voters, including myself, will be subverted to corrupt political interests."